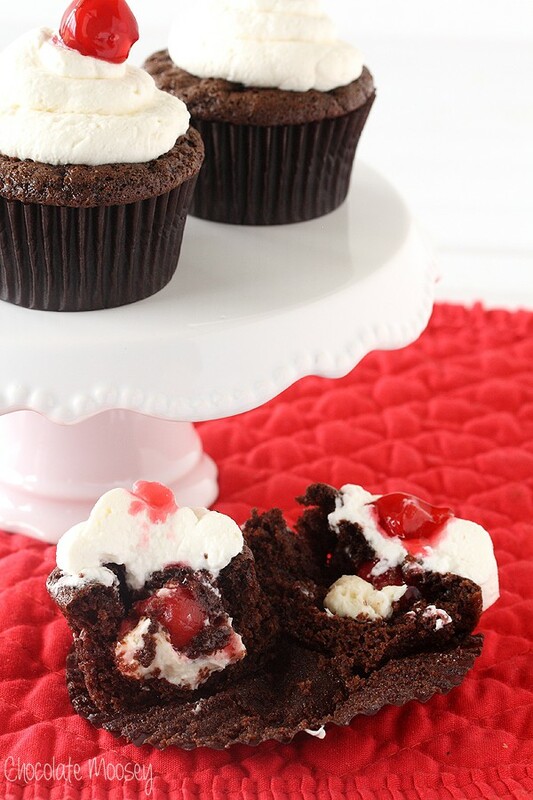 Cherry Cheesecake Stuffed Cupcakes will win over anybody’s heart (and not just for Valentine’s Day either). Really though, you can’t beat chocolate cupcakes stuffed with cherry pie filling and no bake cheesecake. Valentine’s Day is next week, and do you know what that means? 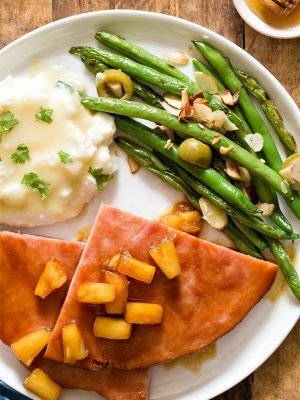 The Holiday Food Party bloggers are back with recipes served with love. You know, I’m not sure if I’ve ever had a Valentine before. Sure, I’ve gotten flowers, candy, and those cheesy cards before, but I don’t think I’ve ever been on a Valentine date. 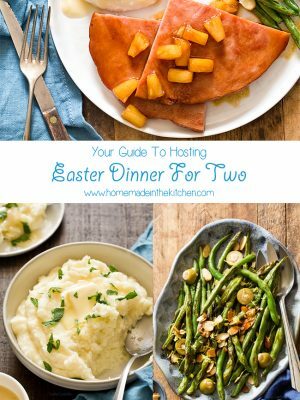 Not that I’d spend my evening at a crowded restaurant, but I’d love to make a dinner and dessert for two (although I’d do that any day of the week, not just February 14). And flowers, well I don’t even like flowers that much. One time I got a carnation and my cat kept eating it. We had to hide it behind bags of potato chips on top of the refrigerator and block access so he would stop (little brat). Want to win my heart? Give me a bouquet of cupcakes. Really really want to win my heart? Give me these Cherry Cheesecake Stuffed Cupcakes because we all know how obsessed I am with cheesecake. 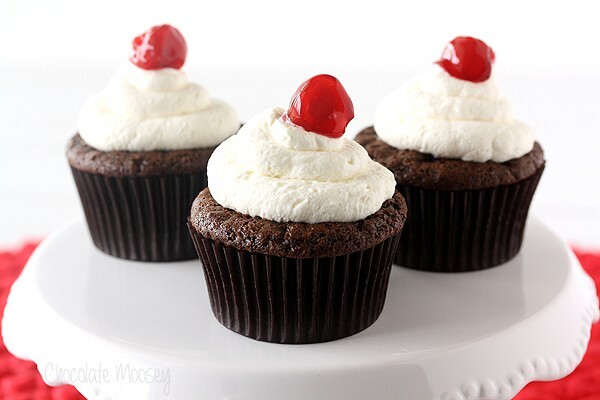 Chocolate, cherry, cheesecake, whipped cream. Sounds like a romantic dessert, no? 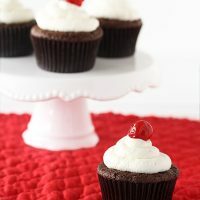 I had the idea for these cupcakes back in July when sour cherries are in season. Except I was so busy traveling, I completely missed it (cherry picking has a very small window, unlike strawberries and peaches). Originally I wanted to make the cherry pie filling from scratch, but it’s nearly impossible in the winter. After striking out on finding frozen sour cherries (not sweet), I did find a can of plain sour cherries. However, after looking at the price tag, I settled on canned pie filling. As you can imagine, these cupcakes do take some time to assemble, but it doesn’t have to be in the same day. 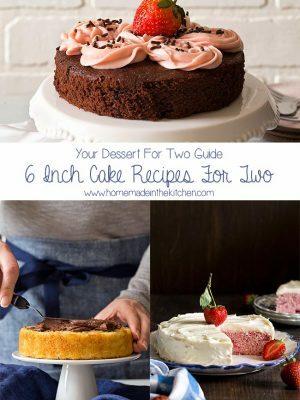 Make the cupcakes and cheesecake filling one night then stuff and frost the next night. 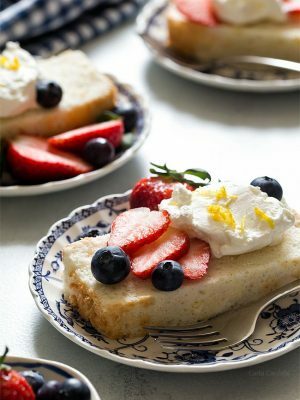 Even though they do require refrigeration, I like to take them out roughly 30 minutes before serving to let the cake “thaw” a bit at room temperature (I’m not a fan of eating cold cake straight from the fridge). Of course that’s in the winter. 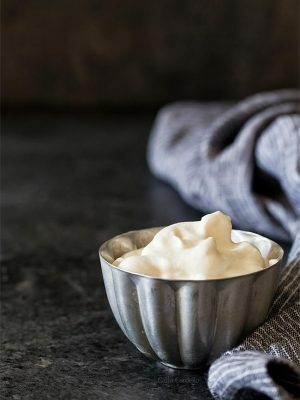 If the weather is warm, you’ll have to use your judgment (especially if the whipped cream starts to melt). Fill liners with batter. Bake 18-20 minutes or until a toothpick inserted in the middle comes out almost clean (you want a little bit of chocolate so they aren’t too dry). Cool completely. For the filling: In a large mixing bowl, beat together the sugar, cream cheese, and vanilla until smooth and fluffy. Set aside. 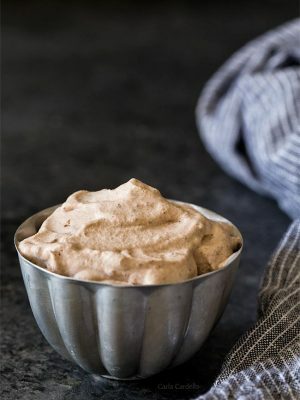 For the frosting: In a large mixing bowl, beat the cream until it thickens. Gradually beat in the sugar and vanilla. Beat on high until stiff peaks form (when you pull the beaters straight up, peaks form and won't fall over). 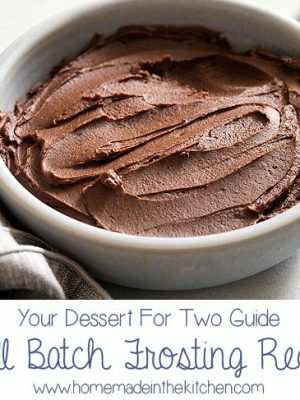 Reserve 2 tablespoons. Keep the rest cold in the refrigerator. Cut a hole out of each cupcake, being careful not to cut through the bottom. Reserve the tops but discard the rest of the crumbs. 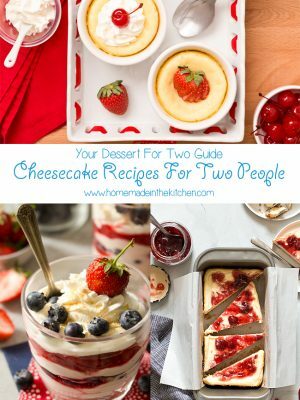 Fold the reserved 2 tablespoons whipped cream into the cheesecake filling. 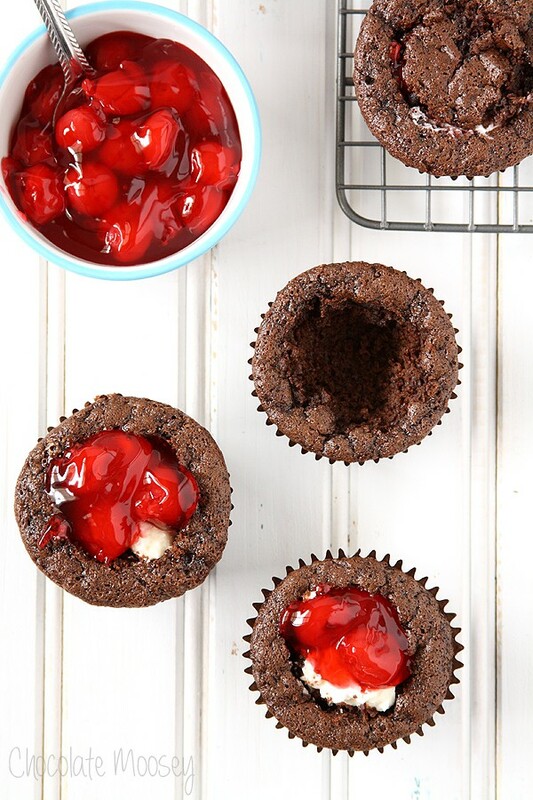 Spoon about a tablespoon into each cupcake then spoon 2 cherries on top. Top with a reserved cupcake top. Repeat with the remaining cupcakes. 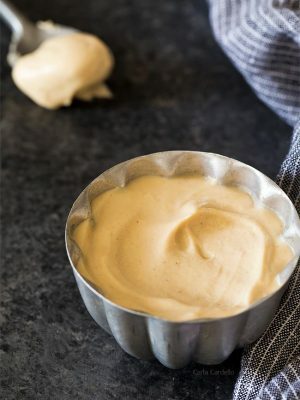 Fill a pastry bag with the frosting. Pipe on top of each cupcake. Top with a cherry. Keep refrigerated in an airtight container. I truly would love making these …I’am a baker for friends an Family.! I have been making new cupcake are my thing right now I’am a master in making Cheesecake now it more cupcake move . I find people like to grab an go easy way have a cupcake.!! Geez Carla! These cupcakes are amazing!!! 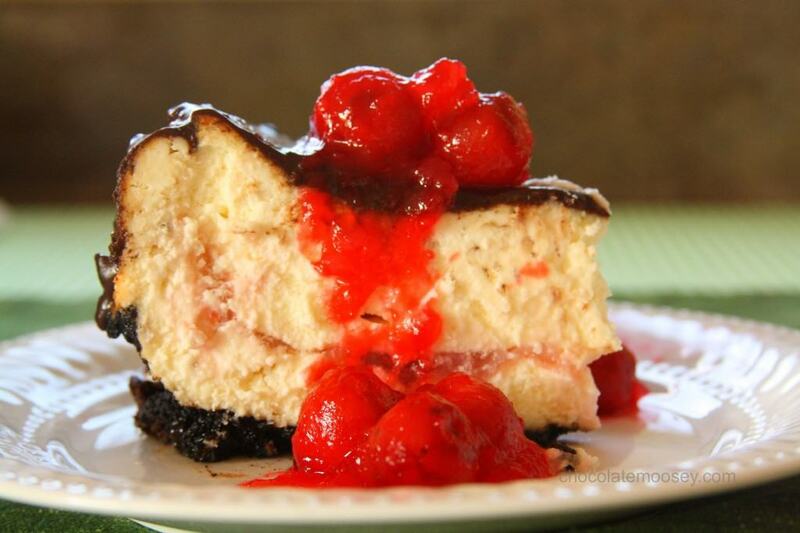 Love chocolate, cheesecake, cherry pie filling, alla that. Yum! I knew I had to make them over the top ;) Thanks! Oh, that is one killer filling! I love these gorgeous cupcakes! These look divine Chocolate Moosey :) I was bummed when I saw how expensive those sour cherries were too. 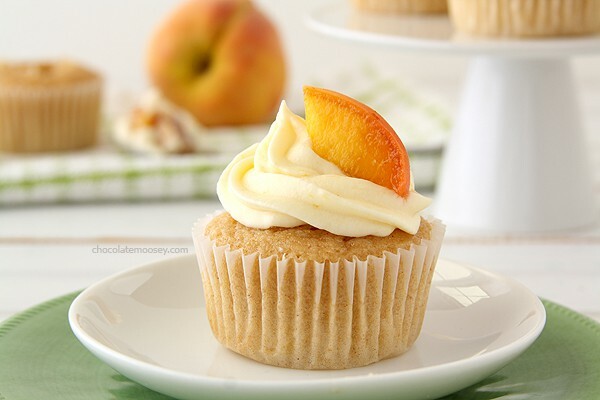 Suddenly a pie that costs $15 to make didn’t seem all that appealing to me ;) Love these cupcakes. Cheesecake makes everything better! Funny about your cat trying to eat the carnation! And YAY for cupcakes! I really need to start shoving things into other things because stuffed food is the best! These cupcakes look incredible, Carla. Don’t sell yourself short on the canned pie filling. I think it’s delicious. I really wish I were biting into one of these and experiencing all the different layers of textures ‘n flavours! Mmm, Carla, I want to sink my teeth into these!! Oh this sounds perfect for you then! Thanks Roxana. How cute for Valentine’s Day!! 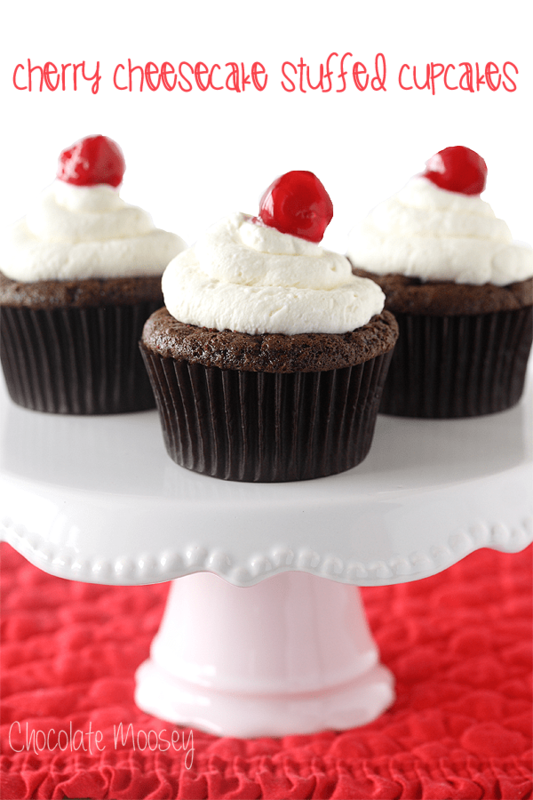 I love cherry anything, but especially when combined with chocolate! 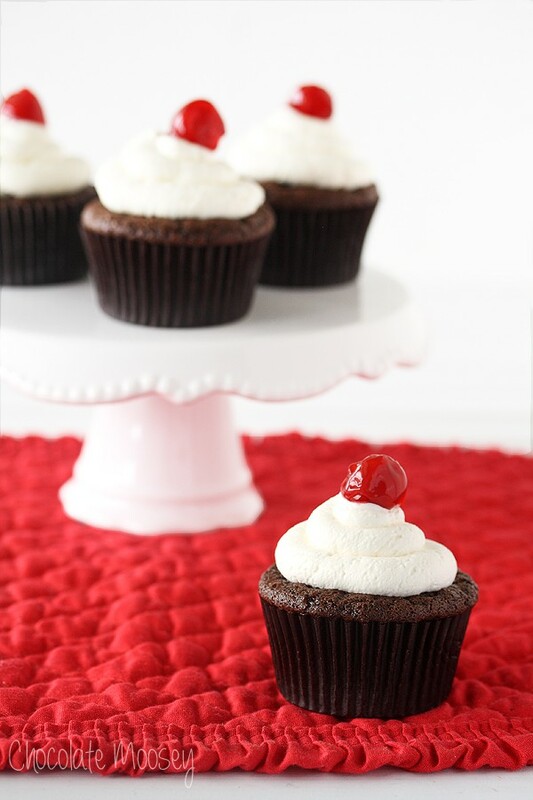 Can’t go wrong with cherry and chocolate. Thanks Jess! Brilliant recipe Carla. And such beautiful cupcakes with a lovely treat inside. oh wow that stuffing is amazing! Some cupcakes are so not worth it…but these look worth every single bite! Love that filling! 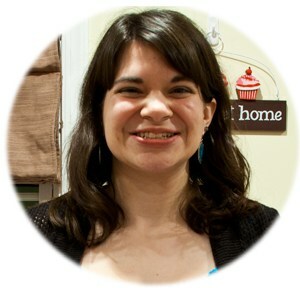 Carla, these cupcake look awesome–I’ve been layering appetizers lately but I think its time to start stuffing things. Thanks! Oh my goodness cherry filling…..loving these and they are so pretty. 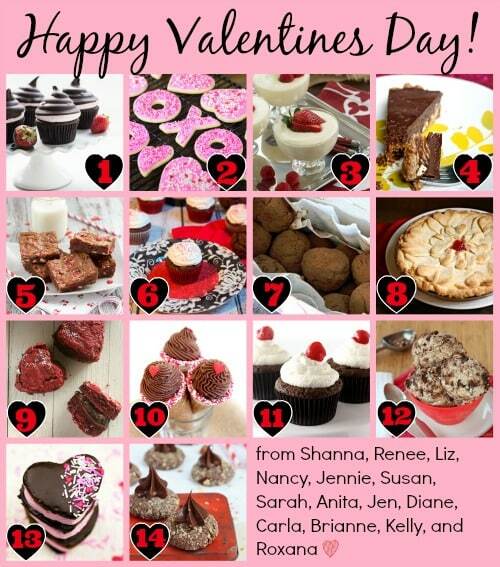 What a wonderful Valentine’s Treat! Stuffed cupcakes for the win! Although I see a big mess with these, not that there’s a problem with that. You cheesecake queen you! Suddenly I have an overwhelming urge to stuff a cupcake! I agree mini cupcakes wouldn’t have enough room for filling, but hopefully you get a chance to try these regular sized!